It's that time again! 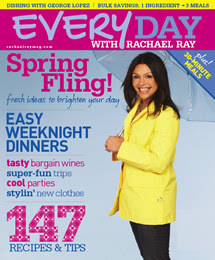 A new issue of Every Day with Rachael Ray is hitting the shelves. I know I sound like a broken record, but this really is a great magazine. There are pictures for every recipe and it also touches on life and home topics in addition to the expected food stuff. So here's what's in store for April. The feature based on the ingredients in the Every Day Kitchen highlights cookies while the equipment feature gives us the low down on toaster ovens. Am I crazy that I love my toaster oven? I think it's because I grew up with a regular toaster. But I digress! I'm excited about the debut of a new part of the magazine - a section about cooking in bulk called Big Time. I use Easy Meal Prep stores and do Once a Month Cooking (but not for the whole month) with some friends, so this will be a great new recipe source. This issues features recipes for three easy chicken dinners. Sounds like the Heat N' Eat recipes recently featured on Rachael's talk show. In the kids section of the magazine, Rachael shares a breakfast PB&J recipe (maybe her PB&J French Toast Sticks?). The highlight of the magazine for me is the 30-Minute Meals section. This issue focuses on a spring theme and includes recipes for Lamb Meatballs in Tomato-Mint Sauce with Couscous, Asian-Style Barbecue Pork Chops and Succotash, Spring Pea-sto with Whole Wheat Penne (yeah for whole wheat pasta! ), Creamy Spaghetti Primavera, Ginger Chicken Stir-Fry with Sesame Noodles (definitely trying that one), Sliced Steak and Mushrooms with Warm Potato Salad, Piquillo Pepper Chicken with Spanish Rice, and Shrimp with Tarragon and Tomato Sauce. We can also learn how to decorate with martini glasses and how to make a risotto bake. The Burger of the Month from the Queen of Burgers is a French Tuna Burger with Green Bean Salad. The magazine also recreates a Southwestern snack for making at home and shares an almond-centric Italian-style Easter cake. The Get Togethers section of the magazine features a Texas cookoff and the Sweet Sixteen party for actress Aleisha Allen. This section also features tips on throwing a pizza party, how to pick wines that look and taste expensive (but which presumably are not), and how to make invitations yourself. In the Go Away travel section, Rachael takes us to Miami hot spots and down Virginia's Crooked Road. And she provides the one piece of travel advice that no traveler can do without - the differences between hot dogs in different cities. I'm off to Munich and Rome in three weeks - do you think they have hot dogs there? We've switched to wholewheat pasta too. Wholegrain if we can find it. It's pretty good!! Much better for us. You have to post that Ginger Chicken Stir Fry if you make it. YUM! I feel like every time I buy whole wheat pasta I am telling the food industry to make more of it! I'm always scared it will be gone when I come back to the store the next time. I made the switch when I learned that eating white flour is basically like eating sugar. It's fine to have your refined carbs there, but I'd rather have mine in potato chips! We switched because we're trying to watch what we eat and I have to watch my white sugar intake anyhow- well, sugar intake, considering Type 2 Diabetes runs in my family.